My dad gave me a book for my birthday that he owned for some years. It was falling apart, so he made his own leather cover for it. Now that is detaching. I may want to try and rebind it. For now, I thought I would share it a little. It is called Household Discoveries An Encyclopaedia of Practical Recipes and Processes by Sidney Morse, published by the Success Company in Danville, Illinois,1908. It is 256 pages of info on all the things you might ever want to do for your home, your health, your cooking, and is incredibly rich in original processes on everything from cleaning solutions to metal work. 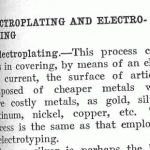 Someone asked me if I could share what the book says on electroplating and electrotyping. I’ve made a PDF file that can be downloaded here.